My challenge, today, is to compress 50 years worth of wonderful memories of Millie’s lasting impacts on my and other MIT students’ lives into eight minutes, but with the help of Laura and a wonderful committee, all of whom are present today, I have managed it. Here are some of the high points from those 50 years. Millie had an enormous depth and range of influence — not just in her impact on women students at MIT, but also in her impact on so many international students, staff, and faculty over the years. My focus, today, is primarily on how she improved the lives of MIT women students and profoundly affected my professional life. And I offer, in loving memory, a few recollections based on personal experience. 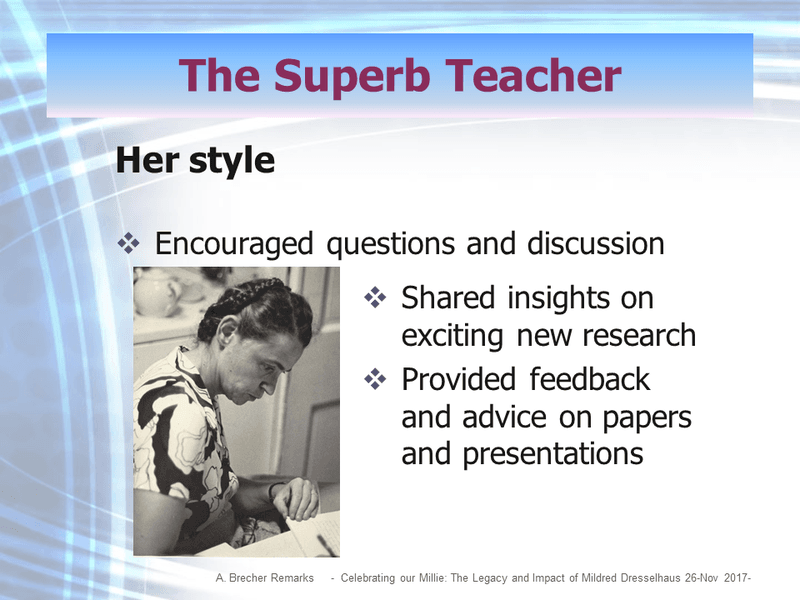 First and foremost, Millie was a superb teacher. I was fortunate to take Millie's first course in Solid State Physics at MIT in 1967, when she arrived from Lincoln Lab as an Abby Rockefeller Mauze Visiting Professor in Electrical Engineering. She taught the best physics course I ever took at MIT and raised the bar for teaching standards. 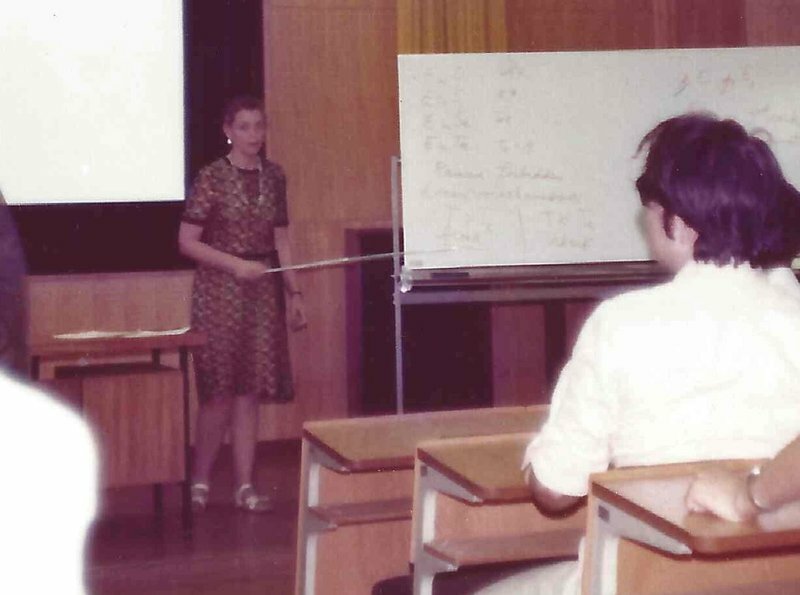 She handed out clear, handwritten notes and asked us to focus on the lecture contents, ask questions, and understand — instead of scribbling notes from the blackboard, which was the norm back then. We were so impressed with her teaching skills, which she brought over from her experience with Enrico Fermi at the University of Chicago, that we petitioned Lou Smullin, then head of EE, to extend her tenure from a visiting professorship to a full professor. He did so a year later, in 1968, when Millie became one of the very few women on faculty in the MIT Schools of Science and Engineering. I must say that she also taught all her undergraduate students how to write scientific papers and present papers at professional conferences. She often held dry runs with us before every major conference (like the annual March APS meeting on solid state in New York) to keep us on time, clear, and crisp. Millie was also an incredible and inspiring role model to so many women physics students, especially in those days when there were almost no women on the MIT faculty. I was atypical: a married foreign transfer student from the Technion, in Israel. And Millie took me under her wing, just as she did with many others who are here, today. She encouraged us all. But she especially encouraged women to persevere, despite the primarily male technical environment at MIT. She often attended our presentations and offered honest criticism — always constructive and, even if negative, always with a smile. Millie believed in the value of applied research and technology careers — solving real-life problems, not just in academic careers, but also working in industry and federal labs. She generously took time out of her busy family and work life to write for many of us glowing recommendations for graduate schools, fellowships, and jobs. In my case, she actually shaped my entire career. She helped me with a recommendation to switch from the MIT to the UC San Diego doctoral program, to return as postdoctoral research associate in Earth and Planetary Science, to become Assistant Professor of Physics at Wellesley while maintaining my lab and research funding at MIT, then encouraged and assisted me to become Senior Technical Consultant at Arthur D. Little, and actually recruited me to serve as an APS Congressional Science Fellow on the Hill when she took over as APS President. 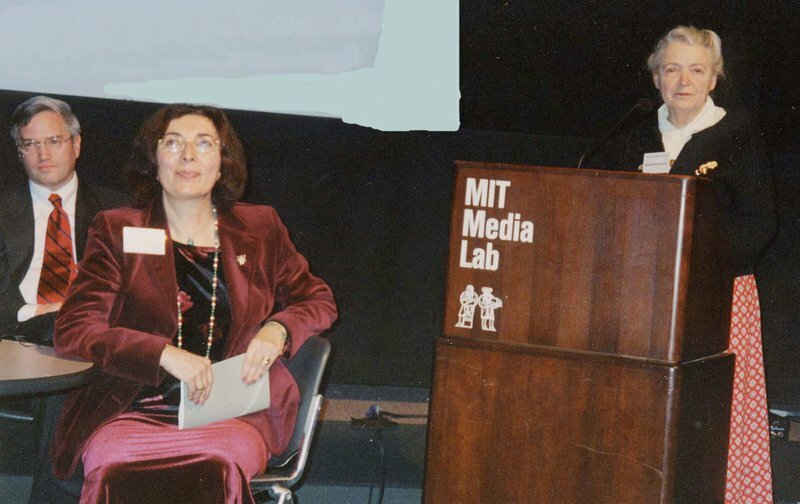 I want to highlight Millie's long-term efforts on behalf of all women students, staff, and faculty at MIT, where she was instrumental in reshaping the climate for women in the science and engineering professions. She was a key player in creating a welcoming and fair MIT for all women students, staff, and faculty. There were very few of us, in those days — only 4% were women students by 1968, when McCormick Hall reached its full potential — and there were very few professional role models. And Millie was often the only and most vocal and influential role model to most of us. While I was away getting my PhD at UC San Diego, Millie was a faculty co-chair of an ad hoc committee on the role of women students at MIT. This committee was created in December, 1971, and, by the spring of '72, it produced a very influential report that affected a broad range of life for women students — ranging from athletics to admissions, financial aid, health, and prospects of advancement to staff and faculty positions. She was the guiding force behind the committee's weekly meetings. And recommendations of this seminal report were implemented very rapidly. All of a sudden, there were two tenured women faculty in the science and engineering schools. Several staff were promoted to faculty positions. Women researchers had better prospects. The admissions office undertook a real effort to recruit more women students. 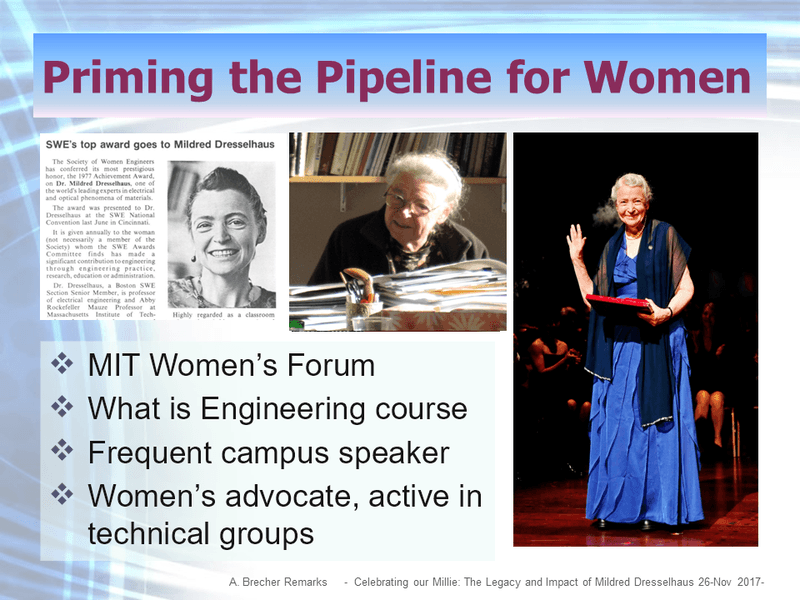 Well, priming the pump is not the only thing that Millie did for sustaining the pipeline for women in science and engineering, not just at MIT but also nationally and globally. She actually worked very hard throughout her career to enlarge and broaden the pipeline and to maintain an active effort through the National Academies and professional societies in order to push for more women in science and engineering professions, and in order to improve both access and working conditions. Back in 1972, when I was a post-doc in Earth and Planetary Sciences, Millie enlisted me on her MIT women faculty and staff informal group, and we met each week to offer support and advice to the MIT women. Millie, along with Professor Sheila Widnall, developed and was teaching the course, “What is Engineering?” in order to ensure that more women students understood the wonderful opportunities that they could have in engineering careers. And many women students were inspired by her example and saw that they could both pursue careers through science and engineering and blend it with a very active family life. Millie recognized and publicized the importance of science and technology policy to enhance R&D funding and education funding. She became active in many technical groups, such as the National Academies of Science and Engineering, the Society for Women Engineers, American Physical Society (APS), American Institute of Physics (AIP), American Association for the Advancement of Science (AAAS), IEEE, and many more. She was on every influential committee, often the first and only woman, and she would get to leadership positions to ensure that committees would actually produce solutions to real-life problems that the women in S&T careers faced. 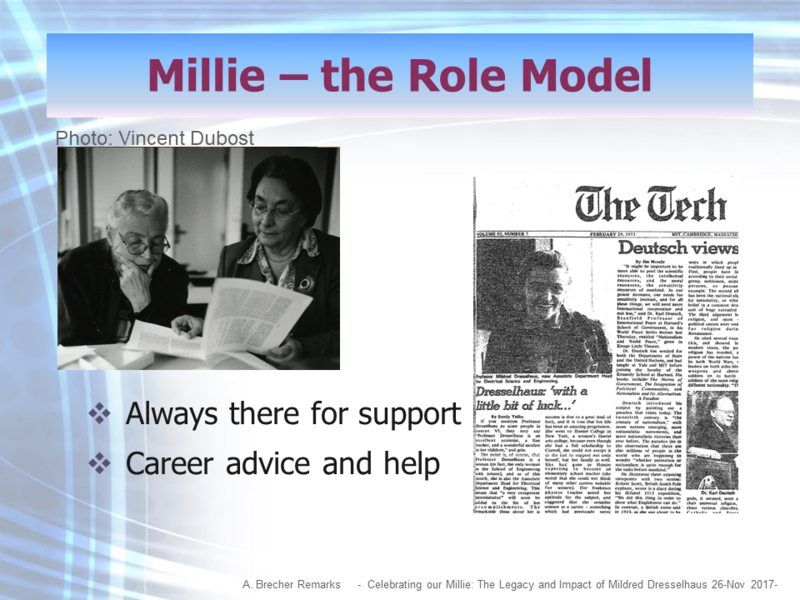 Millie was extraordinarily effective in drumming up support for women in science and engineering. For example, in 1972, she co-founded, along with Professor Vera Kistiakowsky of MIT, the first committee on the status of women in physics of the American Physical Society, which produced the first roster of women in physics. In doing so, she facilitated hiring and promotions in physics departments across the country. When Millie became APS president in 1983, she nominated me to serve as the APS Congressional Science Fellow, because she felt that more solid and unbiased scientific advice would improve congressional rulemaking. After my year on the Hill advising Senator Tsongas, I came back and gave several lectures in her course on Science and Technology Policy, to share my insights on how scientists can influence congressional lawmaking. Finally, Millie was an incredibly inspiring mentor and a lifelong friend to so many of us, both those who are here and many others who are not here. She was always ready with advice and help, ready to support many women who were looking for career options. And she always offered very honest pros and cons. In her 2011 interview for the MIT 150 celebration, Millie described MIT as her extended family, and she described her students as a part of that family. She and Gene regularly hosted so many students at family dinners and holiday celebrations, which was very unusual for MIT. I remember one of the early dinners that I (an undergraduate) and my husband Ken (an MIT graduate student) were invited to: I think Marianne was 13 then, and she had baked fresh bread for us. We had a lively dinner and, afterwards, all four Dresselhaus kids played us a string quartet — with Gene turning the pages! It was very welcoming and truly amazing. Later in life, we were privileged to be invited to Marianne’s wedding at MIT, to Millie’s string quartet concerts, and Millie and Gene graced us by coming to our son’s and daughter’s bar and bat mitzvahs and anniversaries, and also coming to occasional musical get-togethers at our house. 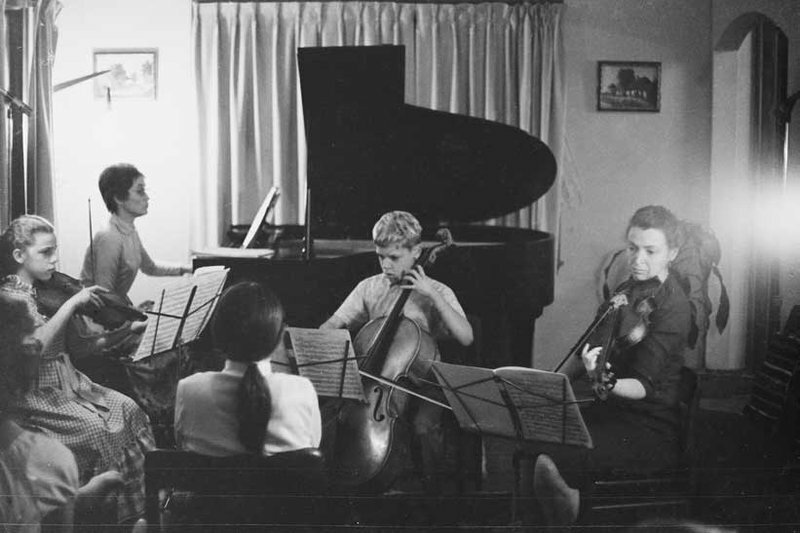 Millie was a very dedicated musician, and I recall her introducing classical string quartets before every EE colloquium — it was, indeed, a very civilizing influence (a soft touch), in a very high-tech environment. The last memory I’d like to share with you is this: Millie never failed to inquire and congratulate us on our career and research accomplishments. And she inspired us to do the same, for other women colleagues and for the younger generations, as she did for so many of us. Millie will be sorely missed, and I will never forget her.